The most recent reunion was at Higher Ground Camp and Conference Center in West Harrison, Indiana July 28 to 30, 2017. Location: The Stone Castle Hotel & Conference Center, Branson, Missouri • Anticipated number of rooms: 50, but we expect more. Room rate is $88.00 per night, unless someone wants a Jacuzzi Room or Jacuzzi Suite. Rooms to be reserved by individuals at 417-335-4700 with Credit Cards; no collection for room expense needed for this reunion. The room rate includes their hot breakfast buffet. If someone wishes to extend their stay, the hotel will honor the group rate 3 days prior and 3 days post event dates. We can bring in our own dry/packages snacks and canned/bottled beverages but perishable food items are prohibited, unless purchased from the hotel. Room reservations after 6/26/2019 will only be accepted if space is available. Any room cancelations must be made 72 hours prior to the date of arrival; if within 72 hours penalty is one night’s room and tax. Check-in is 3:00 p.m. and checkout is 11:00 a.m.
Food is to be catered in by the hotel. Treasurer Rick Melone would have to collect the meal costs and some miscellaneous costs in advance. The exact amount has not been determined. There is no minimum night requirement. In other words, if a family only wants one night, they can book the one night; if they want five nights, they can book all five nights, but must do so before 6/26/2019 before rooms and room rates are released. Since each family or individual must book their own reservations, there is no number of room night requirements as there was at other reunion venues. The room rate is $88.00 per night regardless of the number of people in the room. They do not charge per person, so a large family could probably bring sleeping bags, etc. or if a family wants a rollaway bed, it is $12.00 per night. They do not have a piano or keyboard on site. If we need one, they recommend we rent one or someone in the family brings a keyboard. They will provide a podium and microphone at no charge, but if we want a hand held microphone, they will charge. I would think for our purposes a podium and microphone will work. They will help us set up tables for silent auction items; they will inquire before the event as to what our special needs may be. For our group, we historically have had a buffet meal—lunch and dinner. They charge per person, but one can also go back for seconds at no extra charge. They will bill the reunion account for the meals (no individual billing), so we would have to collect in advance or at registration from those wanting meals and get a meal count. Some however may opt to go elsewhere for either lunch or dinner, but we can address this later when we make our meal selections. The planning committee for the next reunion is Jeremy and Janelle Hoffpauir (joint chairpeople), Ray Bowyer, Kathy Carnell, Marilyn Harbaugh, Karen Lyness, Carol McNary, and Rick Melone.. If you have suggestions for the program, contact any member of the planning committee. The best way to reach the Hoffpauirs is by e-mail, at janellehoff@sbcglobal.net. The 2015 skit is a hit! 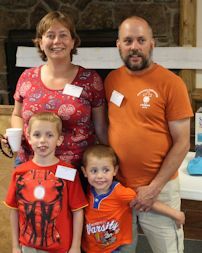 Additional pictures are on the "Lyness Family" page of Facebook.. Click here to see a picture with everyone identified.